Hawaii is one of the world’s premier luxury vacation destinations drawing more than 8 million tourists every year. Vacationers travel from far and wide to experience Hawaii’s beautiful weather, incredible beaches, lush tropical landscape, world-class golf, and of course – our Aloha spirit. Paradise of the Pacific has much to offer its visitors including several spectacular luxury villas spread throughout the islands. With that in mind, we’ve compiled a list of some of Hawaii’s most luxurious vacation rental properties. 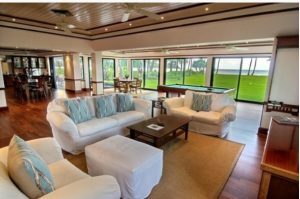 This 10,000 square foot, 5 bed / 5 bath custom-built luxury rental villa on Hawaii Island sits on 1,500 linear feet of oceanfront on the beautiful Kohala Coast. This 8-acre property provides the perfect escape for guests looking for a private retreat. Complete with a gourmet kitchen, games room, media room and private spa, this home also boasts a gym, pool, outdoor shower and daily maid service. Golfers will love the proximity to the course at Mauna Kea while water lovers can enjoy scuba diving and snorkeling all within minutes of the property. To see more of this luxury vacation home on Hawaii Island, click here. This sprawling 6,300 square foot luxury vacation rental home sits on the Kona-Kohala coast side of Hawaii, on the Four Seasons Hualalei Resort. Receding walls in the Great Room and Master suite open to fabulous outdoor living spaces complete with custom stone fireplace, infinity pool, and luxury hot tub. The master suite is an oasis on to itself with its own Jacuzzi for the ultimate in privacy and luxury. Other features include a gourmet kitchen, a temperature controlled and fully stocked wine cave, indoor / outdoor showers and much more. Special resort privileges, concierge services, and world-class golfing are all available for your enjoyment at Sun Opus. Click here to see more of this incredible Hawaii luxury rental villa. This luxury vacation rental property on Oahu is a standout among the island’s villas. Home to Elvis Presley while filming in Hawaii, this beach house-meets-luxury estate is every bit as interesting as it is beautiful. The Sullivan Estate sits on over five acres of beautifully landscaped Hawaiian fauna, with stunning views of the sparkling Pacific. Gourmet kitchen, luxury master suite, fountains, pools, cascading waterfalls, and private viewing decks are among this property’s many exclusive features. This estate is a North shore landmark and one of Hawaii’s most exquisite vacation properties. To see more of this Oahu luxury rental property, click here. 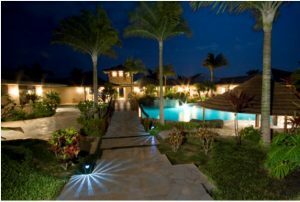 Located on Oahu’s spectacular Kailua Bay, this 10 bed / 11.5 bath vacation rental home is luxury at its finest. Complete with a full staff, this property includes daily laundry and maid service, as well as nightly dinner preparation by a personal chef. In addition, guests will enjoy private lanais off of the bedroom suites, a media room, exercise room, Jacuzzi and sprawling outdoor living space. View more of this incredible luxury rental on Oahu here. This stunning oceanfront vacation property is one of Maui’s premier villas boasting 8 bedrooms and 9.5 baths. Guests will enter and exit the great room via 2 sets of 40 foot retractable glass doors for the ultimate in indoor / outdoor living. Stone flooring, custom cabinetry and granite countertops make for an impressive gourmet kitchen, while marble baths in each of the private suites pamper guests throughout their stay. 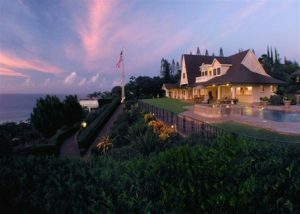 Click here to see more of the Ka’anapali Kahana estate. Located beside Palauea Bay, this Maui luxury vacation rental leaves nothing to be desired. Architect Tan Hock Beng used inspiration from the far east to create this luxuriously Zen property featuring rich wood flooring, walls and vaulted ceilings. Each structure is connected by a meandering stone path through the interior water feature with a Zen garden in the center. Located in popular Wailea, guests will enjoy some of Maui’s top attractions just minutes away from their private oasis. See more of the spectacular Villa Kumulani here. 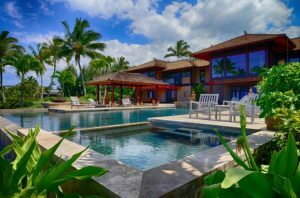 These are just a few of the beautiful luxury vacation rental properties in Hawaii, but there are many more to choose from. If you would like more information about these or any of our other luxury villas in Hawaii, click here and we’d be happy to help. We hope to see you here in Hawaii soon! Aloha!